We’re looking ahead this coming week toward what looks like a remarkable September dry spell for much of Alaska, so here’s your chance to get those end-of-summer chores done that you’ve been putting off. If you’ve got some hay to cut, this could be your best (and last) chance. In the world of weather forecasting, there are not too many jobs tougher than advising a farmer when to cut his hay. Believe me, I’ve been there. The hay needs three or four days to dry, and an unexpected rain resets the clock and risks having the hay rot on the ground. What about the farmer’s perspective? I’ve always thought deciding when to cut the hay must be one of the more anxiety-producing jobs for the farmer too. Well, now I have the chance to play both parts at the same time, at least on a small scale. Long-time Haines farmer Bob Henderson this year offered a small plot of hay for us to cut for our few milk goats, since he no longer keeps goats. We’ll still be getting the bulk of our winter supply from Merv Armstrong up in Dezadeash, about a two hour drive inland (out of Alaska, through a strip of British Columbia, and into the Yukon Territory). From this chart from the Western Regional Climate Center you can see sharp rise in precipitation from mid-summer to the October peak. September, although not as wet as October, is the wettest month of the agricultural year, and at over five inches (140 mm) average, is plenty wet. The chart is for Haines, but the general trend is similar for all Southeast Alaska. In other parts of Alaska the trend is also similar but with the maximum coming earlier the further north one looks — in the Arctic the wettest months are July and August. But what about dry spells, days in a row with no rain? For this I turned to the NWS in Juneau which has a nifty climate database search tool on their website. I did a search for the most consecutive days with precipitation less than 0.01 inch for September (and did not count periods which included a trace of precipitation). I used the Dalton Cache weather station 40 miles west of here because in the database there are more years of data fir it than for Haines (21 vs 12). I also ran the same search for the Juneau airport, which has 67 years of data in the database. 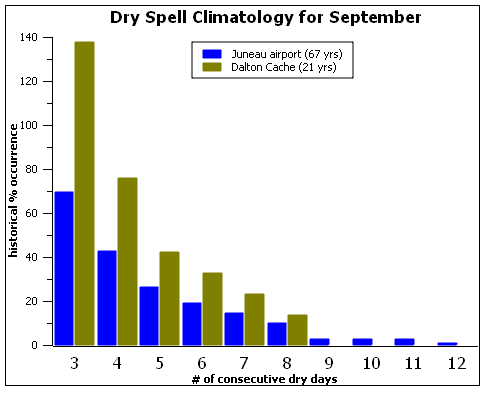 The results show that dry spells of 3 or 4 days are common, but 8 days without rain only happened 3 times in 21 years (or about a 14 percent occurrence) for Dalton Cache. Juneau had 3 8-day, 1 11-day and 1 12-day droughts out of 67 years for a 10.4 percent occurrence. The percentage for each period is figured on the listed number of days or longer, for example, the historical occurrence of a dry period of 5 days or longer in September at Dalton Cache is 40%. We naturally then use this as a predictor and say the chance of having at least 5 consecutive days of dry weather is 40%. We must remember, however, that the predictive power of this technique is only as good as the validity of the assumptions behind it, in this case that the data is good, that there are enough years of it, and that climate is going to be the same in the future as it was in the past. What are the rosy predictions for the coming week based on and am I going along with them? Basically these days, meteorologists rely pretty much exclusively on the numerical models of the atmosphere developed for the purpose. There are other tools and techniques to refine the short range portion of a forecast, say the next day or two, but beyond that the discussions are about which model(s) are looking like they are going to be the best, and what, if any, biases they may have in the given situation. However, past about 5 days in the future, reasonable forecasters will start doubting the specifics of the model forecast and start leaning toward the climatology forecast, that is, don’t go too far out on a limb in forecasting something out of the ordinary. However, I’m about to go out on that limb and bet on something that we’ve just seen happens only about once in 8 to 10 years: an eight day dry period. (Sure today is looking to be zero precipitation, so it’s only a 7 day forecast.) Why go against climatology this way? Looking at the models shows a large pattern of a kind that tends to stick around. It’s not a situation of needing specific small-scale features to be forecast correctly for 7 days out. And furthermore, the various models seem to agree on it, boosting confidence. Here’s one forecast map from one of the models for 4 am on the 13th. It show the 500 mb pattern expected on that day…the pressure field and resulting flow at about 18,000 ft (5,500 m – the numbers give you the height in meters of the 500 mb level). 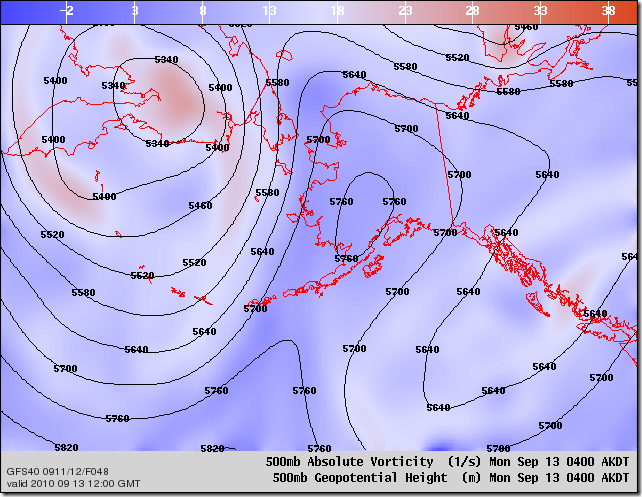 There is a huge low pressure center over eastern Russia, but the happy pattern is the ridge that juts into central Alaska from the North Pacific. This kind of ridge is often called an omega block because it resembles the Greek letter omega, and because it blocks the west to east movement of low pressure weather systems. It also tends to create high pressure at the surface under and to the east side of the ridge, and, most importantly, it is the type of pattern that tends to persist. In the winter this kind of pattern often results in a deep cold snap lasting one to three weeks. Central and southeast Alaska are right in the right spot to benefit most from this blocking ridge. The high pressure that will build at the surface should be inland of the coast giving us a dry source of air and some warming due to down slope winds. Of course with nights almost as long as days now, there will be strong radiational cooling and probably some frosty nights in the interior as well as dew or fog in some areas (which obviously will work against the hay drying goal). Well, I may not be going too far out on a limb since I’m really simply agreeing with not only the models but also the NWS forecasts. However it is still a little of a funny feeling calling for so much dry (and warm) weather for this time of year here on the rain coast. More uncertain is whether the hay will dry even if the forecast is good. I’ll report back on that one. In the mean time, I’d love to hear your comments, questions and hay cutting advice via the comment link.